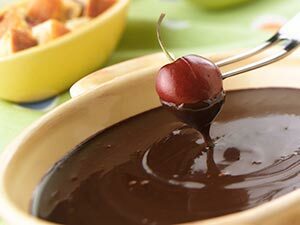 Chocolate fondue is a retro dessert that has a lot going for it on modern menus. It’s shareable, it’s based on the most popular dessert flavor and it’s interactive. Executive Chef Foshee updates the classic recipe by melting together two types of chocolate with creamy mascarpone cheese. 1. In top of double boiler, combine both chocolates, cream, mascarpone, sugar and bourbon or liqueur. Fill bottom of double boiler with water; bring to a simmer over medium heat. 2. Place top of pot over simmering water. Heat until melted, smooth and warm, stirring often. Remove from heat. 3. Pour mixture into fondue pot and keep warm. Serve immediately, accompanied by pound cake, fruit and marshmallows for dipping.